I seem to be on this pepper kick lately. I’m not surprised, since I have a tendency to obsess over certain ingredients for a few weeks (or months… remember the cheese problem? I’m so glad to be cured!). Though I’ve never been a fan of green bell peppers, I do love all the sweeter ones like red, orange, and yellow peppers. I love their bright colors, their light but distinct flavors, and most of all, I love that they don’t seem to take over an entire dish like their green cousins can. Instead of dominating a dish with their flavors, the sweeter bell peppers add just a little something extra, and that is what I was looking to do last night when I was trying to figure out what to have for dinner. This was another one of those fly-by-the-seat-of-my-pants dishes that I hadn’t even planned on having – or creating. I was thinking of working on a couple older recipes I’ve been meaning to post, but due to my limited decision-making skills, I couldn’t decide which one to make. All I knew was that I wanted something with peppers in it. Out of frustration, I decided to make something up instead, and I truly love it when that happens. Some of my favorite dishes have come about this way, and it’s always fun to see what happens when you play with your food (in a non-food-fight way, of course). This time I figured I’d play with those beautiful large shrimp that I’d scored at Whole Foods on my last $25 Shopping Cart run. Heat 1 T olive oil in a medium skillet over medium high heat. When oil is hot, add the thawed shrimp and quickly stir-fry until they turn pink. 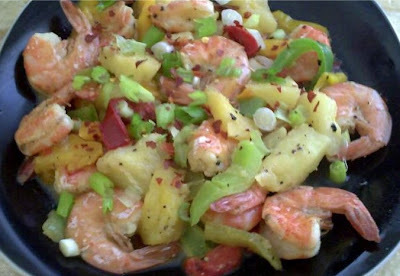 Remove the shrimp from the skillet and set aside on a separate plate. In the same skillet, heat the remaining tablespoon of olive oil. Add the chopped garlic and cook for just about 30 seconds or so. Add the peppers, pineapple, and seasonings, and reduce heat to medium low. Allow the peppers & pineapple to cook for about 4-5 minutes, or until they begin to soften slightly. Return the shrimp to the skillet and cook for another minute or two. Garnish with chopped green onions and extra crushed red chilies, and enjoy! This sounds divine. Adding it to my "to make" pile. I made this for dinner tonight - quite good, but a little dry. Next time I'll add 1-2 T of pineapple juice, also might add a pkg of snow peas near the end. It's a keeper ! I made this last night too. Yummy! I used fresh pineapple and added a little juice. The sweet pineapple and the crushed red pepper made a nice sweet/spicy balance!